Medminder is a medication reminder solution aimed at revolutionizing medication management. Through the use of a smart pill dispenser, Medminder’s goal is to make it easier for patients to take their medications on time. 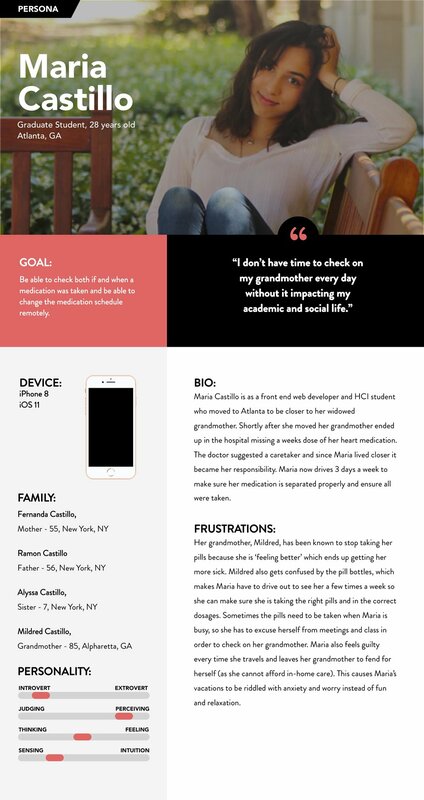 Design a mobile application, and accompanying wearable, that connects to Mediminder’s smart pill dispenser to help a caregiver ensure their loved one takes their medication on schedule. Maria Castillo is a 28-year-old graduate student who has become her grandmother’s primary caretaker. While she doesn’t live full-time with her grandmother, she is still responsible for making sure she takes her pill on-time. She bought her grandmother a Medminder smart pill dispenser, but since Maria isn’t always present, its hard for her to know for sure if the medication has been taken. Based on peer feedback I got from my sketches, I set out to create a higher-fidelity prototype using Sketch and Invision. The first screen gives users an overview of the day, breaking down what medications have been taken and which still are remaining. The pills are separated into traditional pill boxes broken down into: morning, day, evening, and bedtime. A user can click on one of these boxes and a dropdown will appear which displays further details on the pills.This screen also displays the percentage of pills taken during the day so as to give the user a quick visualization of the day’s progress. This is where users will input their medications. I aimed for a clean layout and pills modeled after the most common shapes to make it easily recognizable for the user. I presented my prototype to two participants and asked them to think aloud as I provided them with a task. I explained that they should take on the persona of someone who has been given the responsibility of monitoring their grandmother’s pill intake via the MedMinder app. Didn’t immediately click on the boxes, was surprised when she clicked and realized they provided more information. The arrow should be more obvious to focus on the interaction. Excited that there is an option to easily contact doctors, sees the use for it. However, thinks there should also be an easy way to contact grandmother.